Posted on April 19, 2015 by No Map Required Posted in Art, Art & Engineering, Peru, Places	. This is our premiere Book Club blog! It could be the first of many or the first-and-last, we’re not sure. I guess we’ll see what you think. After visiting Machu Picchu, our good friend Don recommended Turn Right at Machu Picchu. One thing lead to another and here we are testing out a new segment on NoMapRequired. Not your typical travelog, the author retraces the foosteps of Hiram Bingham, the man who “discovered” Machu Picchu in the early 1900’s. (Convenient that a young child hiked with him to the exact location.) In the process the author tells his own story of a middle age guy hiking through Peru while also describing the history of the last Incas and a smidge about Francisco Pizzaro, who conquered the Incas but missed Maccu Pichu. He also tosses in a bit of current events and a dash of international politics. That’s a lot wrapped into one compelling story. Warning: it IS long, some might say “thick” but unlike a lot of books, this one is very well written. It’s interesting and entertaining: I laughed aloud… No really! I liked it because I was able to say, “I was there…I was there too!” Being there was helpful, too, because it made it easier to pronounce the names of the places, but if we’re honest about it, nearly everyone reading this blog is a much better reader than me, so you’ll be fine. 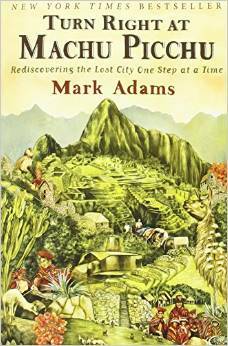 I think this book would appeal to people who have either been to Machu Picchu or are itching to go. So there you have it! My first No Map Required Book Club Review. If you have a favorite travel-related book you think I should read, let me know. It doesn’t have to be thick either. Light and airy is always nice. We are always looking for good reads to get us through the next bus ride. I read this book some time ago. I’m in the “itching to go” group. Hope you get to scratch that itch soon – so worth it! This is the been there-done that-would do it again friend of Debby’s. The first time 1971 there were only 15 people going up that day (if you can imagine), and we climbed the last leg of the mountain, threw up on top, and spent the night in the ruins. Yes, and next day went to the twin mountain. After many more travels, I still think this is the most magnificent place on Earth. The second visit was during Inti-Illimani, the Quechua Festival, there were thousands if not millions there and a slight Earth Quake while I was wandering one of the trails. A bit scary, but what a way to go! Crazy! Sleeping the ruins? That’s definitely NOT the sort of thing they’d allow today! Sounds incredible.